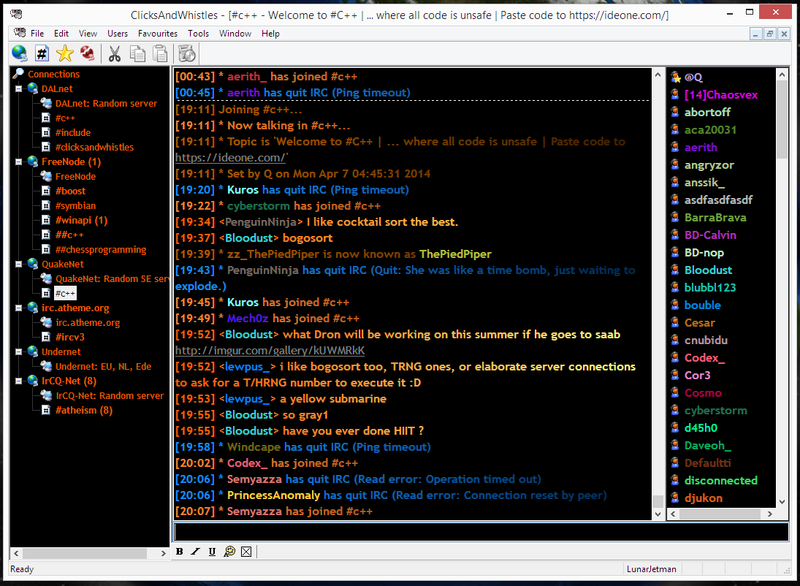 ClicksAndWhistles is an IRC client for Windows. It supports multiple server connections and \"identities\" allowing you to have different nicknames on different servers. There is support for Unicode (UTF-8) messages. Keywords and emoticons with optional sound effect can be added. PNGs, JPEGs and GIFs (including animated) are supported in addition to customizable themes allowing individual window appearance to be customized with various text effects. Two text display modes (\"Normal\" and \"Column\") are available. Direct chat and file transfers are supported. Secure (SSL/TLS) servers are supported.